The UNC School of Medicine reports that weekend warrior injuries occur in both men and women of all ages, but especially among formerly active 30 plus adults, who are inactive during weekdays. The Centers For Disease Control reveals that over 10,000 Americans receive emergency room treatment for sports and recreational injuries daily. Wear athletic shoes while riding a bicycle. Never wear flip flops, sandals, high heels, clogs, slippers, or go barefoot while riding, unless you want to have an accident. To avoid backache, use the correct size bike. The type of bike you ride should be compatible with your journey. Don’t ride a racing bike, when you really need a mountain bike. If you’re core muscles are weak, the chances are good you’ll experience low back pain during or after your ride. Begin to strengthen your core before your vacation. Wear proper footwear. Replace worn out treads before you leave on vacation. Don’t over train (running too many miles, for too long). Don’t run on concrete. Grass or dirt trails are better shock absorbers. Stretch after your run. Keeping your muscles supple helps to avoid injury. Muscle imbalance can cause running injuries. Before your vacation, get a postural assessment through a local chiropractor, or fitness professional to determine whether you have muscle imbalance. To improve overall strength, hire a fitness professional to teach you how to cross train, by adding strength training to your routine. 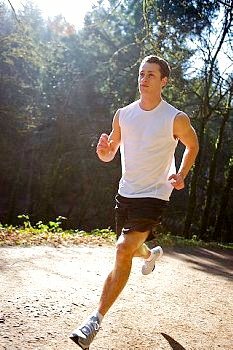 Posted on May 4, 2013, in Exercise, Exercise Injury Prevention and tagged bicycling, cross training, jogging, running, Sports injury, srength training, weekend exercise. Bookmark the permalink. Leave a comment.